Indoor comfort control is more than just temperature control - it means creating a healthy home environment by purifying your indoor air. Did you know that the EPA considers indoor air quality a major health concern? Modern homes are sealed tightly to conserve energy, but this also results in trapped air that becomes stale and polluted with things like mold spores, pet dander, bacteria and toxins from cleaning and personal care products. The good news is that ALL WEATHER HEATING and COOLING provides products that integrate into your HVAC system and work together to clean, purify and humidify your indoor air! 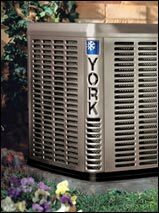 York Affinity™ air cleaners are an affordable choice for all homeowners who have a central home comfort system. These units integrate with your existing heating and cooling system, so they clean the air throughout your entire home, delivering 24-hour filtration when you need it. In addition to being highly efficient, they require less maintenance. There's also the year-long benefit of a cleaner home with reduced triggers for allergies and asthma attacks. With the indoor air quality component you and your family can begin breathing easier! Whole house humidifiers, like the York Affinity™ series, work to keep your home comfortable year after year - all from one centralized location in your home. Fan-powered units mount easily on the supply air plenum and blow moisture vapor directly into the ductwork. Bypass humidifiers mount easily to the warm or return plenum. Water is supplied to the distribution tray and flows evenly across the water panel. Heat from the heating system then causes the water to evaporate and properly humidified air (vapor) gets distributed throughout your entire home. You can protect your home and your family from allergy-causing mold with York's Ultraviolet Lamps. These ultraviolet air treatment systems kill mold that would grow in the cool, damp interiors of your air conditioning system. They use the same technology that's long been used by water treatment facilities and is now adapted for safe and efficient home air purification. UV air purifiers are mounted in the duct work just outside your HVAC system and work with air cleaners, ventilators and filters to keep your family healthy. The Heat Recovery Ventilator System removes stale, unhealthy air and replaces it with a stream for fresh air. Its powerful centrifugal blowers bring fresh air into your home and at the same time, exhaust stale humid air in an equal amount. Both incoming and outgoing airstreams pass through a heat exchange core where the energy from the exhaust air is efficiently transferred to the incoming fresh air. An air duct system supplies the fresh air brought in by the ventilator and distributes it throughout your home. Another duct draws the existing stale, humid air back to the ventilator and then exhausts it outdoors. Dehumidification can be very important if you live in areas of high humidity. High humidity in cooler temperatures gives you a wet clammy feeling and in warmer temperatures causes a wet sticky feeling and causes perspiration to stay on your body and soak in to you clothes rather than evaporate. York's Dehumidifier helps keep your home refreshed and healthy.